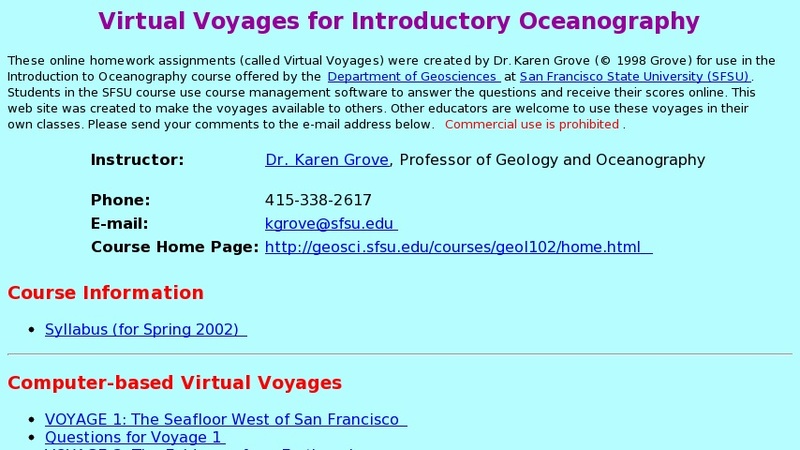 These Virtual Voyages were created as one-hour homework assignments for a freshman-level oceanography course at San Francisco State University (SFSU). Each voyage is structured around real-world images and includes five multiple-choice questions and five short-answer questions. Topics include seafloor bathymetry west of San Francisco, Earthquakes, Hawaiian hot spot, ocean waves, tides in San Francisco Bay, interaction of fresh and salt water in San Francisco Bay, ocean currents, sediments, and habitats for life.